We don't get to see many closely fought and exciting test matches these days. Most of the test matches are dull and dominated by the home side. Touring countries always find it difficult to adjust in foreign conditions and every match becomes one-sided. With the rise in popularity of T20 Cricket, test cricket desperately needs some exciting and enthralling matches in order for everyone to remain interested in it. A close fought exciting test match always make you believe that test cricket is still the best format. Where every session tells a new story, where greats and cricketing legends are made. We can often see upsets being pulled off in limited over matches, but it rarely happens in test cricket as the 5 days of cricket ensures that only the better side comes out on top. With that in mind, these are the top 5 test matches of the 21st century. A splendid partnership of 205 between Faf du Plessis and ABD and a shocking last 19 deliveries made this match a thriller. Chasing the target of 458 runs from 136 overs South Africa came quite close to breaking the world record for the highest chase in test cricket. At the start of the 5th day, they needed 320 runs with 8 wickets in hand and a draw was their more realistic goal. But ABD and du Plessis had other plans. By the time these two were dismissed South Africa needed 16 runs from 19 balls with 3 wickets in hand. But Vernon Philander and Dale Steyn shockingly batted out the 19 deliveries without even trying to win and secured a draw for their side. West Indies time and again have been able to raise their game to pull off upsets. Needing an improbable 418 for victory in the second innings, Ramnaresh Sarwan and Chandrapaul scored centuries each and helped pull off a massive upset by making the highest successful run chase in test history. This test match went as close as it could get. After facing 122 deliveries for the 10th wicket, it was the second last ball of the test match from Eranga which prevailed over all the efforts of Moeen Ali and Jimmy Anderson. At the point when the 9th wicket fell it simply looked like a formality and it looked that Sri Lanka will win easily. But both Moeen Ali and Anderson stuck in to put up a remarkable fight for the draw. Ali completed his century and Anderson batted for 55 balls without scoring a single run. But it wasn't to be as Sri Lanka won on the second last ball of the match. It was the match which gave an example of what test cricket can create. It gave an example of why test cricket is clearly the best format there is. This test match gave an example of why Australia were so great during this period. Their never say die attitude won them matches out of nowhere. Chasing the target of 282 runs set by England, Australia were 175 for 8. Just when everyone thought England will win this game easily from here, Brett Lee joined Shane Warne and put up 45 runs together which took them closer to the target. 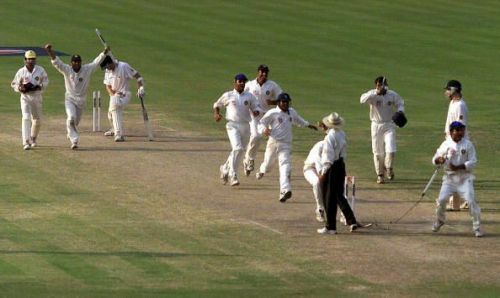 They required 62 more runs to win the match but Shane Warne got hit wicket. Australia's last wicket pair of Lee and Kasprowicz included a sensible 59 run partnership. But just when it looked like Australia were going to get the win with only 3 runs needed, Steve Harmison produced a gem of a delivery to get Kasprowicz caught behind. This whole series between India and Australia was test cricket at it's best. It is considered by many as the turning point in Indian cricket. It was only the third case in history where the side following on had won. Australia batted first and hit 445 with Steve Waugh making 110. Then they dismissed India for a total of 171 in the first innings. Australia looked well set for an innings win when Waugh enforced the follow-on and India were on a score of 115 for 3 before Rahul Dravid came out to bat. He and VVS Laxman amassed 376 runs together. India declared the innings at 657. Chasing the target of 384, Australia were dismissed for 212 with Harbhajan taking 6 wickets. With this win, India famously put a break on the 16 match winning streak of the Australian side.